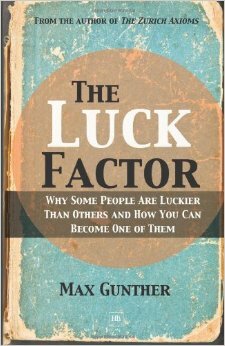 Max Gunther walks us through the nature of luck, how we can better manage it and therefore improve our luck. Luck – “It blunders in and out of our lives, unbidden, unexpected, sometimes welcome and sometimes not. It plays a role in all our affairs, often the commanding role. No matter how carefully you design your life, you cannot know how that design will be changed by the working of random events. You can only know the events will occur. It will be useful to take a brief look at this reluctance. You must clear it out of your way before you can begin the process of changing your luck. You must stay keenly aware of the role luck plays in your life. Never confuse luck with planning. The loser’s problem lies in the inability to make the crucial distinction between planning and luck. The trick is to know what kind of situation you are in at any given time. Can you rely on your own or others’ planning, or will the outcome be determined by luck? The first step in controlling your luck is to recognize that it exists. The lucky personality gets to know everybody in sight: the rich and the poor, the famous the humble, the sociable and even the friendless and the cranky. There are two ways to be an almost sure loser in life. One is to take goofy risks; that is, risks that are out of proportion to the rewards being sought. And the other is to take no risks at all. Always assume the run is going to be short. Never try to ride a run to its very peak. Don’t push your luck. We hear more about big wins than about the vastly more common little wins. One reason why luck selection is so difficult for most people is that it almost always involves the need to abandon part of an investment. Lucky people, as a breed, are able to live with the knowledge that some decisions will turn out wrong. Most lucky men and women, on the whole are not straight-line strugglers. They not only permit themselves to be distracted, they invite distraction. Their lives are not straight lines but zigzags. Long-range plans aren’t actually harmful, but it is important not to take them seriously. Supernaturalism is defined as any belief in an unseen spirit, force, or agency whose existence hasn’t been proved to everybody’s satisfaction. The connection in my opinion is that a supernatural belief, even a trivial and humorous one, helps people get lucky by helping them make otherwise impossible choices. The best strategy would seem to be one of maximum flexibility: keeping ourselves free to deal with those unknowable events in whatever ways seem appropriate at the time. The trouble with too much talk is that it can constrict that valuable freedom and flexibility. The lesson of this Ninth Technique is that the luckiest people guard against unnecessary talk. They are particularly careful when talking of subjects that have great personal importance to them. They reveal no more of their thinking than they have to. They don’t lock themselves into positions where there is no good reason to do so. By avoiding excessive communication, lucky men and women are freed of the need to explain and justify actions to other people. There are experiences in life that seem to be lessons but aren’t. A noteworthy trait of the lucky is that they know what they can’t learn anything from. Nonlessons often grow out of unwarranted generalizations. If one would be lucky, one must know what one can’t learn anything from. The fact is that fairness is a human concept. The rest of the universe knows nothing of it. The universe has no interest in what you deserve. Lucky people always seem to have many ventures going on at the same time. Only a person who alters your luck over a long term may be called a destiny partner. This entry was posted in Books and tagged Luck, Max Gunther on June 2, 2015 by Blas.